The decision, on January 29th, by the UK Parliament to seek to re-open negotiations with the European Union, leaves companies in a state of limbo. Companies, and individuals, do not have a definitive Brexit roadmap. Nevertheless, companies need to prepare for a no deal Brexit. The likelihood of the UK leaving without a deal is increasing day by day. Below, we have listed a number of issues that are worth considering when planning for Brexit. We have also linked to many of the articles that we have written on the issue. 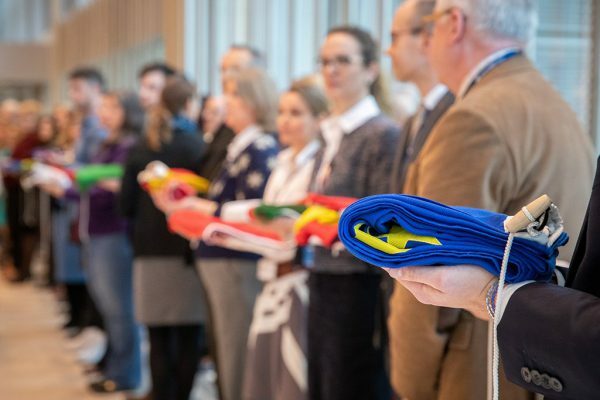 The symbolic lowering of the member state national flags at the EMA’s London offices (pictured right) was, perhaps, the most vivid visualisation that the UK is actually leaving the EU very soon. The Churchill Place office of the EMA will close on March 1st and then the agency will enter into a period of transience that won’t end until November of 2019. In the immediate week after the closure of the London office the EMA staff will spend a week tele-commuting while emergency issues will be dealt with by staff at the new Amsterdam facility. From mid March the agency will work from a temporary office base in Amsterdam while their permanent home in the Zuidas district is readied. The agency has already stated that it expects to lose approximately 30% of their staff as a result of the move. Added to that, the vagaries of Dutch employment law means that the EMA will not be able to rely on contract staff as they had initially planned before a new location was announced. We have written extensively on the future of the EMA, including a number of analysis pieces about the cities that were pitching to host the agency. We also looked at issues that have arisen as a result of the move. Furthermore, the issue of how the EMA will interact with the Dutch national authoriity will be one that will be watched closely. The agency had an excellent working relationship with the MHRA and many in the sector are interested to see if the same style of relationship and level of co-operation will develop between the respective agencies. The departure of the UK from the European Union means that the UK will be treated as a third country. While it might be sensible for both the EU parties and the MHRA to remain aligned, there are competing factions within the UK that are seeking to deregulate many sectors including the medicines sector. How long that such an arrangement might continue is a moot point. There are some within the Brexiter camp that would wish to diverge almost on exit from the EU, while there are others who might wish to align permanently. As such, companies that have held back awaiting a definitive decision must now make moves to protect their interests. While there is an expectation that Article 50, the instrument governing the UK’s departure, might be extended for a period of three or nine months. However, nothing is guaranteed at this stage and the UK is still on schedule to leave the EU on March 29th 2019. Here, we have highlighted many articles that will give you an initial assistance in determining your next course of action. Acorn Regulatory can assist you every step of the way with issues relating to Brexit. Contact us today on 00353 52 61 76 706, email: info@acornregulatory.com or complete the details below.